LOUISVILLE, KY (MAY 31, 2017) – On May 24 of this year, just over a week ago, the National Museum of Racing Hall of Fame and its’ respective “Pillars of the Turf Selection Committee” made a huge announcement. The 2017 class named to the “Pillar of the Turf” was to include the late John R. Gaines; the late Ogden Mills “Dinny” Phipps and the late Col. Matt Winn. To say that group of distinguished gentlemen is – and was – a power trio, is akin to saying that Secretariat was a racehorse. All three were guiding lights in an industry in dire need of candles. All three were innovative, thought-provoking and creative with ideas and images of a better game, a bigger sport. But mostly, all three were willing to put their names on the line to make something happen. To say the least, they were not shrinking violets. More like burning bushes. I had the pleasure of meeting and working with two of those gentlemen – Mr. Gaines and Mr. Phipps. Both remarkable in different ways. Yet, all three of these industry giants have left a mark on the sport we love. Several years after creating and launching The Breeders’ Cup, Mr. Gaines had persuaded his longtime friend, media advisor and conscience Fred Pope to embark on a final life ambition – to create a national governing body for the entire Thoroughbred racing industry – The National Racing Association. Gaines’ vision never got in the way of his eyesight. In fact, he could hear and see just about anything he really wanted to hear and see. Or was it the other way around? He didn’t let his eyesight get in the way of his vision? Regardless, John Gaines knew, from the very beginning, that this was an impossible task that he wanted to make happen. He knew that all the naysayers would make this journey rocky and curvy, littered with pitfalls and snares. Yet, he forged ahead. He knew that this job was going to be his toughest yet – and, yet, he was willing to tough it out. One day, out of a blue summer sky, I received a phone call from Mr. Pope. He asked if I would meet him for lunch. He asked if I would be willing to help him and Mr. Gaines in this newest endeavor. Yes, I answered. And, I did. Or, I did my best. We made phone calls. We planned. We documented. We begged and borrowed everything from office space, to note pads, to telephone equipment, to meetings. Then, one day, Fred asked if I could make an overnight trip to Atlanta to meet with a group that Mr. Gaines eyed to assist with the project. I agreed to go. Didn’t know at the time that my plane was scheduled to leave Lexington at 7 a.m. and that I was scheduled to return to Lexington later that same day at midnight. When I arrived in Atlanta, a car and a driver were waiting at the airport. I jumped in. We sped off to a downtown office complex, arriving just in time for breakfast. In came a group of three men, each meticulously dressed. They walked and talked like some Deep South politico. They were in fact politicos, and lawyers and big thinkers. Great, I thought. Game on. There was Hamilton Jordan, the former Chief of Staff to President Jimmy Carter. A classy, Southern gent who talked with a Georgia drawl and with words easy to hear and understand. There was Tim Smith, a quiet, stoic, learned man who listened better than any person I had ever met before or any person that I have ever met since. And, there was Greg Avioli, a brash, young, confident kid straight out of law school and GQ magazine. They were an interesting group. I remembered saying something to this affect: “Yes sir, they are nice enough. They don’t know anything about Thoroughbred racing, though.” Mr. Gaines laughed a little and said something like this: “We can teach them about Thoroughbred racing. We can’t teach them to be good people.” How true. Never forgot that. Never. On May 20, 2008, Hamilton Jordan passed away at the way-too-early age of 63. From a cancer that many thought he contracted from working with asbestos in Vietnam. In 1998, Tim Smith became the first President of the National Thoroughbred Association, which morphed into the National Thoroughbred Racing Association – never becoming what either Mr. Gaines or Fred Pope truly envisioned — and served in that capacity until 2004. Greg Avioli followed Tim to Lexington and joined in the fun. Now, he has surfaced as the President of the Thoroughbred Owners of California. John Gaines knew horses. That came naturally. Turns out that training humans was the toughest trick. Eventually, he mastered that, too. If he hadn’t, there would never have been a NTRA, or a Breeders’ Cup for that matter. Which brings us to Col. Matt Winn, the former president of Churchill Downs who may have singularly saved Churchill Downs from ruination, preserving the iconic Twin Spires and, truly, creating the spectacle that has become the Kentucky Derby. Martin J. “Matt” Winn – a native of Louisville and one of the city’s staunchest supporters — was born in 1861 and passed in 1949. He watched Aristides win the first Kentucky Derby in 1875 and witnessed every single rendition thereafter until his death at age 88 in 1949. Since I wasn’t born until 1956, I never got the opportunity to know Col. Winn firsthand. But it didn’t take me long to make his acquaintance. Years ago, I stumbled across a copy of the book, “Down the Stretch. The Story of Colonel Matt J. Winn.” Bought it at an old bookstore on Woodland Ave. in Lexington. Probably have read it cover to cover 10 to 15 times now. DOWN THE STRETCH. The Story of Colonel Matt J. Winn as told to Frank G. Menke. It is an easy read. I like to think that’s the way Col. Winn was, too. An easy man to read and know. An easy man to like. But not an easy man to bend or break. I knew John Gaines and Dinny Phipps. In my mind, I know Col. Matt Winn. His book still has a place on my office desk, now signed by current Churchill Downs President Kevin Flanery. These gentlemen were all dreamers who didn’t while their lives away with simple wishing. They were all doers who lived their lives their way, always working to make the game; the sport; the industry better. This Saturday, Churchill Downs will be hosting the Grade 3 Aristides Stakes. The Stakes is named in honor of the first Derby winner – a race that Col. Matt Winn never forgot; and a race that Col. Matt Winn spent the rest of his life promoting. Ironic? Perhaps. Fitting? Absolutely. Just like the mantle of praise bestowed on this year’s class of honorees to the Pillars of the Turf. Many thanks go to the Pillars of the Turf Selection Committee for its’ work. Their nominees for honor and memory are impeccable. Chairman D.G. 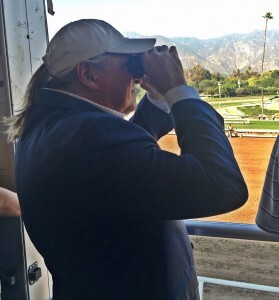 Van Clief, former President and CEO of the Breeders’ Cup, is one of the nicest folks on earth. One voting member is Bob Curran, who head of corporate communications for The Jockey Club, again one of the nicest people anywhere. Another voting member of the selection committee is Amy Zimmerman, who has worked for Santa Anita for over 30 years in many capacities – including the director of broadcasting and VP of Business Coordination. And, you guessed it, one of the finest you will ever meet. It takes good people to recognize good people.